wait a minute ... isn't pitch black? Recently, the image to the right reminded of my heritage, as a Bible Thumping Baptist. The image didn't set right with me, and it took a few moments to process why. First, it called back to the legalism I was entrench. Secondly, it touched that old spirit of division and elitism that so easily ensnares all of us through Denominational Doctrine. It's been a while since I've last read Genesis and Hebrews, so I headed back there to re-read the story of Noah. Noah was saved by grace, through faith - not through obedience as many would like to believe. So then, what do we do with obedience? The modern church doesn't need a relationship with God in order to function: they just need charismatic leadership, money and enough nicely designed programs to keep people entertained in their pursuit of pleasing God and measuring up through obedience. So it's not the style of music that drives people away from God, it's doctrine without relationship enabled through good works programs. 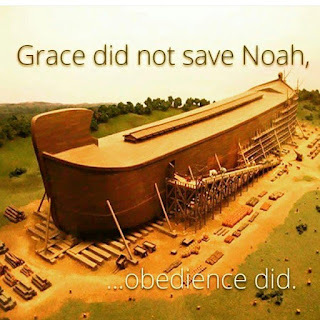 It wasn't obedience that built the Ark, it was the works of faith, based in a relationship with God. Isn't faith with works, obedience? The problem with legalists of all stripes, is they put obedience before their relationship with Jesus Christ. How can one obey, if they don't have Jesus Christ dwelling within them? Phil 4:13 - I can do all things through Him. I would agree: faith with works is obedience. But one can obey anything. We can obey a policeman when he says halt. We can obey the pastor when told to tithe, support a program, or when told to wear culottes and not jeans. None of those things require a relationship with God.